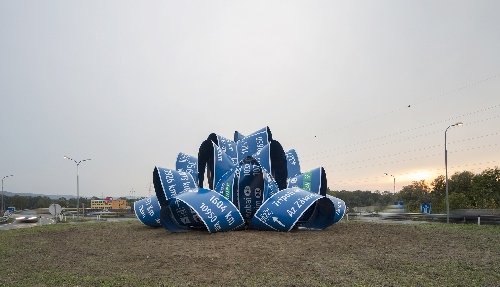 Installed at the Stockerau roundabout in Lower Austria, Jitish Kallat’s Here After Here After Here, connects the traffic circle to the world and becomes one of the largest permanent public sculptures by an Indian artist outside of India. 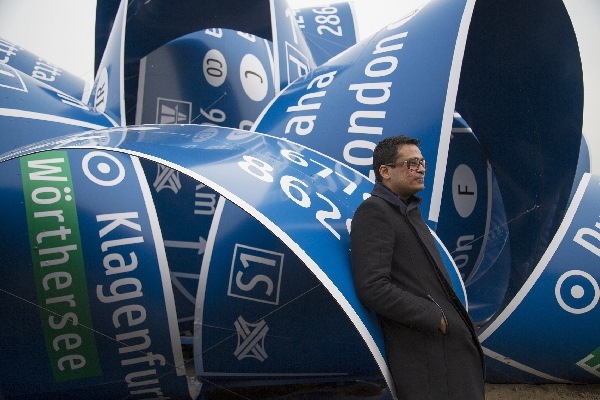 In 2012, Advisory Council of Public Art Lower Austria and the Regional Consortium of Ten Municipalities looked to Indian artist Jitish Kallat to create a large permanent sculpture for Stockerau. The roundabout served as a nodal point on the expressway, connecting multiple towns. What Kallat delivered was a mammoth piece he titled Here After Here After Here. The permanent piece resembles a loop of infinitely stretched traffic signs. Jitish Kallat pulled from mythic symbols, alchemical diagrams, ancient knot work, and sacred geometry to produce a compelling sculpture that measures six meters high and seventeen meters wide. Using the connectivity of the expressway as inspiration, Kallat added text and symbols connecting Stockerau to places around the world. New York, Singapore, Paris, Mumbai, Beijing, Brasilia, Bucharest, and Marrakesh are just a few of the global references on the sculpture. Each shows the actual distances and exit you could take from Stockerau to arrive at any of these places. Jitish Kallat rather whimsically mapped the circular form of the Stockerau roundabout onto the spherical form of the globe, connecting the traffic area symbolically to the rest of the world. Jitish Kallat has previously had works unveiled at leading museums such the Art Institute of Chicago where his ‘Public Notice 3’ was showcased. The immense popularity of the sculpture resulted in it being displayed for an entire year, with the exhibition having to be extended three times. This isn’t unusual for Kallat’s works. His solo exhibitions at both the San Jose Museum of Art in California and the Art Gallery of New South Wales in Sydney enjoyed long runs. Here After Here After Here is notable as his first permanent sculpture on public display. Jitish Kallat was born in 1974 in Mumbai, India and completed his Bachelor in Fine Arts from the Sir J J School of Art in the same city. He has been celebrated around the world with his solo exhibitions drawing crowds at places such as Haunch of Venison in Zurich and London, Arario Gallery in Beijing and Seoul; Arndt in Berlin, Galerie Daniel Templon in Paris and Nature Morte in Delhi. He continues to live and work in Mumbai. Tagged Art, Indian Art, LifeSpice. Bookmark the permalink.